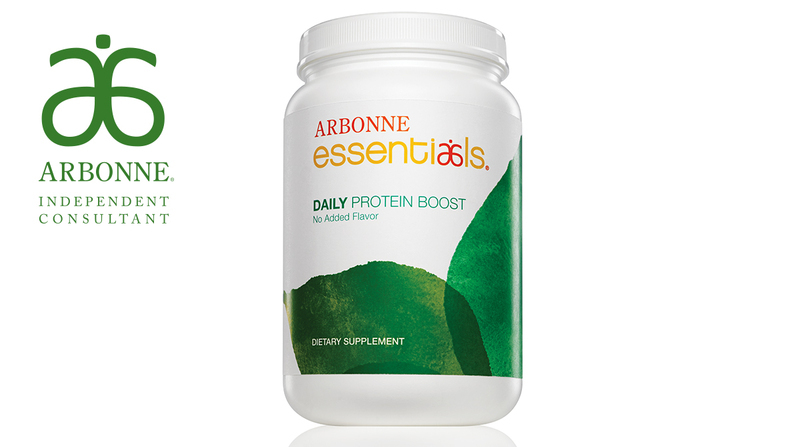 Arbonne Daily Protein Boost - Take your protein to the next level! Each single scoop of Daily Protein Boost delivers 10 grams of plant based protein from pea, rice and cranberry, making it a natural, healthy and plant-based protein choice. Simply add a scoop to your favourite foods or beverages once or twice a day - each scoop will offer you 10 grams of protein, helping the body to grow and repair itself and helping you to feel fuller for longer. Made without added sugar or flavours the Arbonne Protein Boost offers maximum flexibility. Thanks to the natural flavour of the protein, which has almost a bean-like quality, it goes perfectly with savoury dishes too, so you can even add it to soups, porridge, pastas and other sauces. For extra boost, you can combine it with Arbonne Essentials Protein Shake or PhytoSport™ After Workout, to further increase your daily protein intake to support muscle recovery and strength after exercise. Click 'Order now' above and fill in the product enquiry form to find out how you can receive 20% off the Arbonne Daily Protein Boost (Standard RRP £30) by becoming a Preferred Client! Remember, by becoming a Preferred Client, you can receive 20% off any Arbonne products all year long too! Or, to browse the full range of Arbonne products, visit the Arbonne website. Protein is an important dietary macronutrient that we need every single day. Protein is made up of amino acids which help support muscles, and is necessary for tissue building and repair and other critical physiological functions. Want to know more - read this blog to find out more about getting enough protein or visit the NHS website about healthy eating. It's recommended that we consume 0.8 grams of protein per kilogram of body weight - this is approximately 56 grams per day for the average sedentary man or 46 grams for the average sedentary woman. Having one to two portions of Arbonne Daily Protein Boost can help ensure your body is getting the fuel and nutrients it needs alongside a healthy, balanced diet. When should I use protein powder? Use Protein Boost before you work out to help lower damange to your muscles as you train. You can also use it post-workout to help promote muscle recovery and strength. Or, you can even add it to your meals throughout the day - add a scoop to your morning breakfast smoothie to help create a more balanced, hearty breakfast when you're short for time. Want to know more about maintaining a healthy diet and how protein plays an important role in keeping your body fuelled? Get in touch for a chat!